The word "Washi" is derived from the "Wa," meaning Japanese things, and "paper. 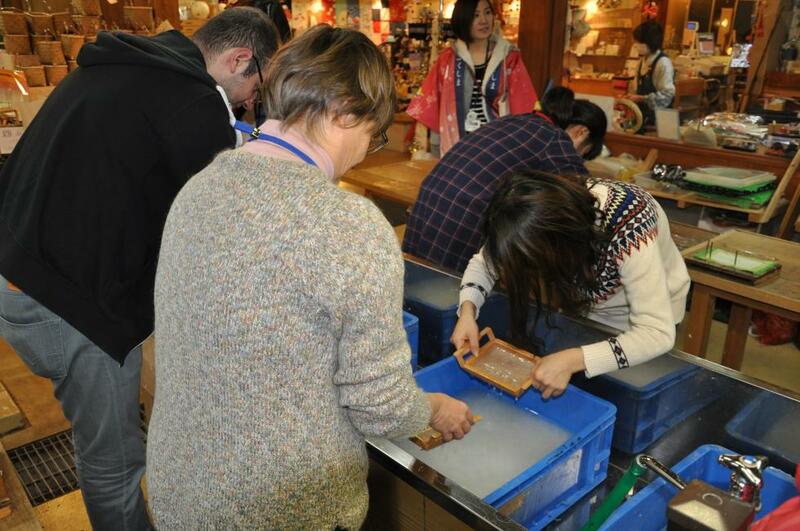 "Recently Washi has become one of the intangible cultural heritages of UNESCO. Paper was originally introduced to Japan from China in the 7th century. In China hemp was used to make paper, but Japanese made paper using the inner bark of paper mulberry, paper bush and ganpi (diplomorpha sikokiana). Washi is known for its beauty, ability to absorb water, and incredible strength. In the city, high-quality handmade Japanese paper technology has been passed down for more than 1,000 years since the Heian period (794 to 1185). The local paper "Mayumi paper" made in the Kamikawasaki area is said to have been highly appreciated by famous writers in the Imperial Court such as Murasaki Shikibu and Sei Shonagon etc. For the production of Japanese paper, cold water and low temperatures are indispensable for its quality, so a long and complicated process mainly done during the winter is necessary. At the Kamikawasaki Washi Folklore Museum located on the Michino Eki Adachi on Route 4, you can actually experience Japanese paper making while receiving guidance.